I went to Bowman Lake with this picture in mind. I thought that with the burst mode of my new camera, this would be easy! Guess again, bucko! 105 photos later! 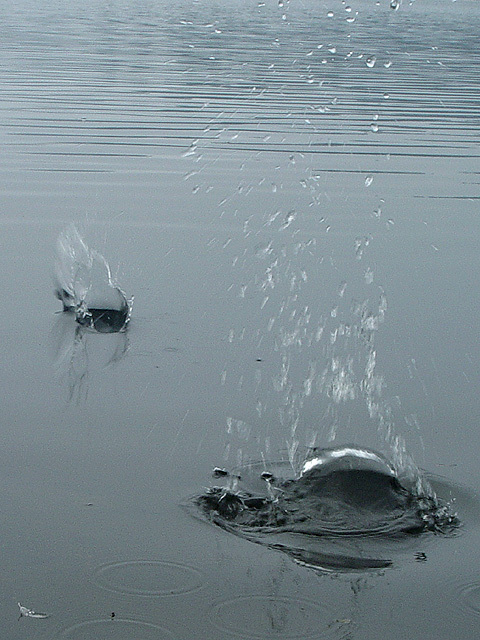 Many did not have any splashes at all, some had the rock on it's way to the water, but a few had the effect I wanted. You can certain feel the motion here. You know exactly what is going on in the photo without having to read a thing. I like the fact that you have smooth water up-close and ripples in the background. It gives nice perspective. Looks like a hard shot to get and pretty poor lighting too. My main issue is that I don't think the shutter was fast enough - I'd like it more with a faster shutter/ maybe higher ISO to really freeze the droplets that are in the air and to give a crisper splash. A great idea and good execution apart from that though. Hey, I bet that makes it a LOT easier to "skip" stones...for a half-mile or so! Unique sequence of stop-action captures -- I suspect this was trickier than it looks, or else used trickery I don't notice...How long did you have to wait between throws? Nice photo. Big skipper, eh? YEAH!! Great! That must have taken all day! Nice shot. Did you only get 1 skip? Focus and lighting are very good. Certainly meets the challenge. 9 waltoml. That looks great. The only thing I would change is the focus on the droplets in the air. if they were in focus better this would definately be a ten. Oh maybe a tighter crop to exclude the ripples in the top background area if the front droplets were in focus better. Skipping stones. Fun shot. Great focus and composition. In my opinion this is a good example of stopped motion. But I don't see the stones! I like how the water dances though. This absolutely meets the challenge. I am wondering if it might have had a little more impact if you had increased the saturation. Probably one of the most original shots in this challenge. Good job. Great shot. I can not even skip a stone, let alone capture such a great motion shot as this one. Good luck. Proudly hosted by Sargasso Networks. Current Server Time: 04/21/2019 02:16:20 AM EDT.